**IMPORTANT. 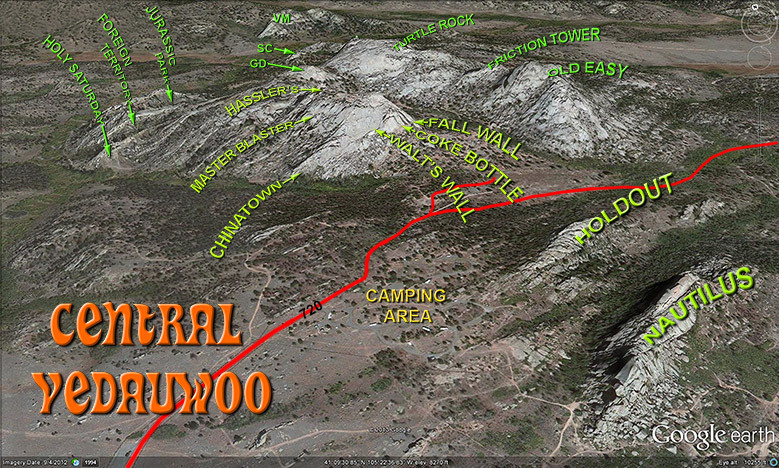 PLEASE NOTE THAT ONLY ROUTES FOUND WITHIN CENTRAL VEDAUWOO, AS WELL AS ON THE NAUTILUS AND HOLDOUT are documented here. Everything else is considered as either ‘OUTBACK AREAS’ or as ‘OUTLYING AREAS’. The little schematic on the right also represents Central Vedauwoo. It corresponds to the area marked ‘A’ on the orientation map shown at the bottom of the Intro Section. On it you can also see Road # 700 to # 702 to the parking areas (shown in black / black dots). Trails to the climbing areas are shown in red. 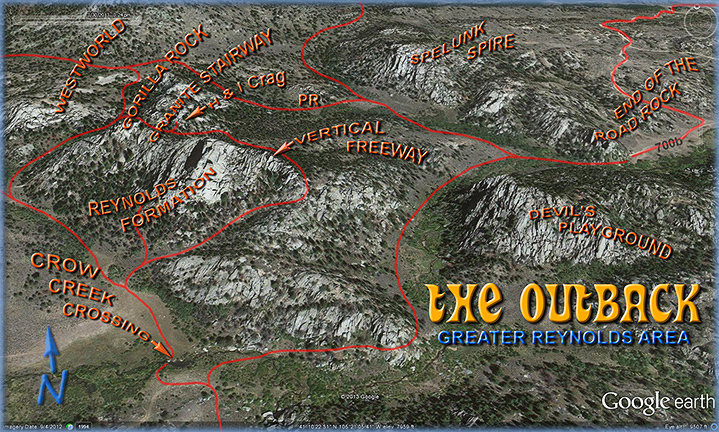 The red line extending around the rock formations (shown in blue) is the Turtle Rock Trail (TRT) and the one in the middle is the Box Canyon Trail (BCT). Other abbreviations are: CM = Central Massif, HS = Holy Saturday, JP = Jurassic Park, GD = Glen Dome, TR = Turtle Rock, FT = Friction Tower, OE = Old Easy. 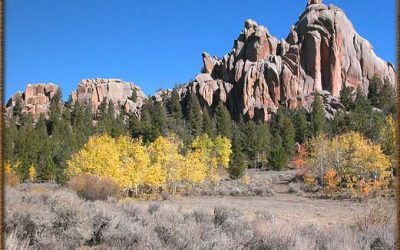 To get an idea of the scale of things, the Turtle Rock Trail is just about three miles long, end to end. Would you like a ‘bird’s eye view’ of this alluring place? 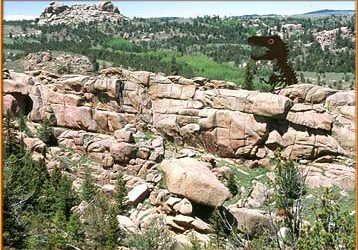 It’s possible – thanks to a video taken by ‘daemn42‘ while attending a reunion of the University of Wyoming Outing Club back in July of 2013. 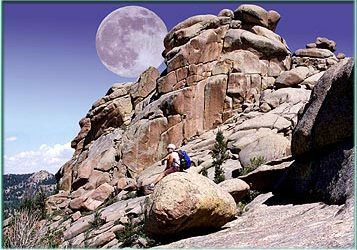 Coincidentally, members of this organization have been responsible for considerable development of Vedauwoo as a climbing area, starting with early ‘summit bids’ in the late 1940’s and 50’s. 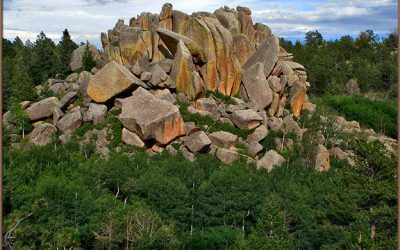 It was their foresight, abilities and continuing commitment to original route development that largely formed the basic core of climbing activity at Vedauwoo that continues to this day. We owe them a debt of gratitude for these efforts. So watch the video to the left and see how the key formations of Central Vedauwoo (only) spatially relate to one another. Alternatively, you can simply click on the ‘timeline’ and obtain ‘still’ images with a bit of explanation shown below left. Either way the ‘organization’ of the place becomes bit more understandable. *NOTE: ‘stopping points‘ along the timeline are indicated when a specific formation and/or route is being seen. Pause here and lots more detail can be appreciated. Then move on. Thanks ‘daemn42’ for a great job. Very informative stuff!! Three forethoughts: 1.) Buckle up your seatbelt, there’s some turbulence ahead. 2.) A huge volume of detail has been left out for the sake of clarity and brevity. You can find detail in the ‘choice boxes’ found below. 3.) You can either watch the video on a ‘full screen’ or you can leave it small and click on the timeline for pausing on ‘high value stills’ with a bit of explanation. 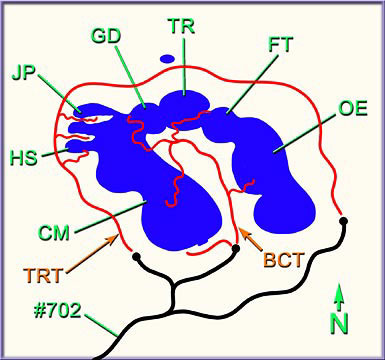 The formations are indicated in blue and the climbs are in orange. Boxes are arranged in clockwise order beginning with Fall Wall. 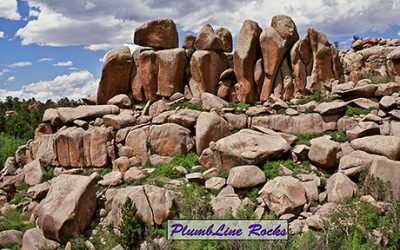 MANY SUPERB FORMATIONS SURROUND CENTRAL VEDAUWOO. 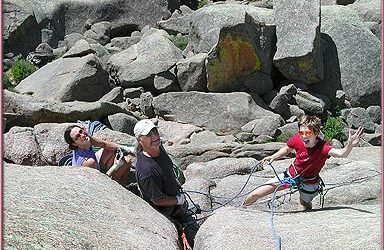 There is probably more climbing and especially adventurous routes on these unique and challenging crags than there is in all of Central Vedauwoo. Some formations are large and significant such as those found in the GREATER REYNOLD’S AREA, BLAIR, and the CITADEL, while others are more compact (POLAND ‘HILL’ and the VALLEY MASSIF) and sometimes hidden such as SOUTH CORNER, THE SOLAR COLLECTOR and the more recently developed A-MAZE-ING. 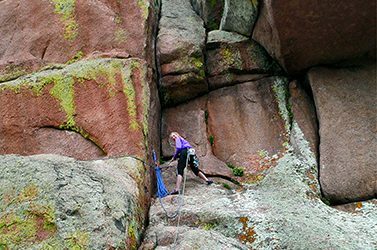 If you take the time….. to explore these gems, you will find a surprisingly wide range of routes from light, recreational and moderate to very difficult and highly technical and very difficult in nature. While some climbs are quite simple and straight forward like ………. to challenging, hard off widths like those found at the VERTICAL FREEWAY, mixed lines like ………. DON’T MISS OUT ON THESE unique, uncommon and exceptional experiences. BELOW YOU WILL FIND SOME CLICKABLE MAPS OF THESE AREAS. GO AHEAD AND EXPLORE AROUND. ODDS ARE YOU WILL FIND WHAT YOU ARE LOOKING FOR. This is a work ‘still in progress’, so everything won’t be covered for awhile. It should be obvious that the marked/numbered red lines are USFS Roads, while the unmarked red lines are major trails. Also, you can still use the hotlink list at the left to get to where you ‘want to go’. ** SEE CLICKABLE ‘IMAGE MAPS’ BELOW. Approaching the steep face of ‘Uncertainty Principle’ (11b/c, A-Maze-ing Crag). Click on the boxes below to find more information about your area. 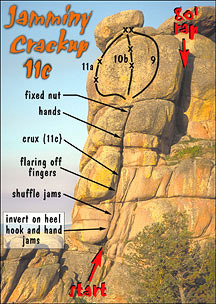 H&I Crag in the outback area of Vedauwoo consists of H’ (aka Rusty the Pig) 10c, ‘I’ (aka Animal Cracker Land) 11b, and Jay Bird 10d Hand crack(s). Reynold’s Formation are part of the DEVIL’S PLAYGROUND. We shall see about this soon. Luebben inverted on ‘Squat’ (12b OW at the Roof Ranch). 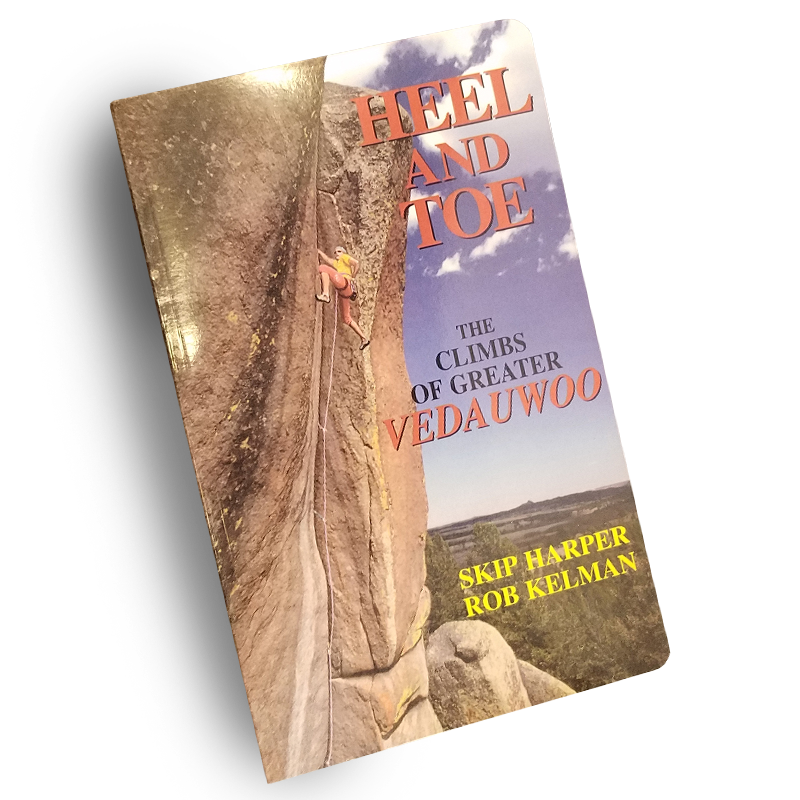 Since publication of Heel and Toe in 1994, considerable route development has taken place. Here is a sampling of these new creations with descriptions and topos found below. 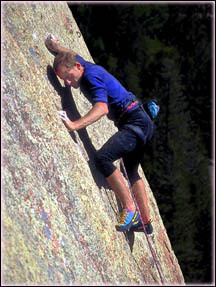 “Revenge of the Nothing” (11b/c) was put up on the right end of the COKE BOTTLE in Central Vedauwoo in 1995. 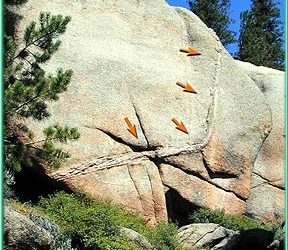 It is a fairly long, steep, one pitch bolted (12 bolts) face route that traverses right from the start of “The Neverending Story” before it ascends the rightmost water streak. The traverse is extremely delicate, requiring lots of precision footwork and sidepulls using small crystals. As the traverse transitions vertically, thin exfoliation edges are found within the scoop of the waterstreak and a sequential series of small crystals provides additional purchase. 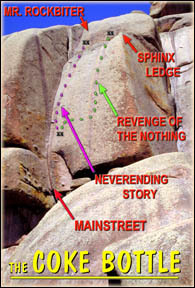 A Fixe Ring anchor set was placed onSphinx Ledge at the top of the climb. Mark Duff negotiating the very delicate, balancy traverse on Revenge of the Nothing. “Revenge” can be reached in two ways. 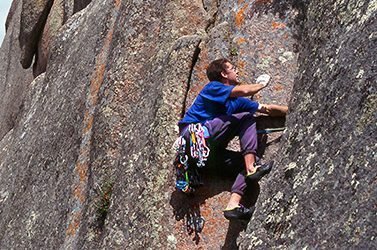 First, one can step right soon after the crux of Mainstreet to a sizable corbel, above which has been placed a double anchor belay station. This is the traditional start for Neverending Story. 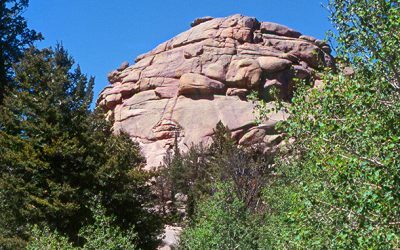 Alternatively, the route can be accessed from above by first rappelling to Sphinx Ledge and then rappelling to the bottom belay station. 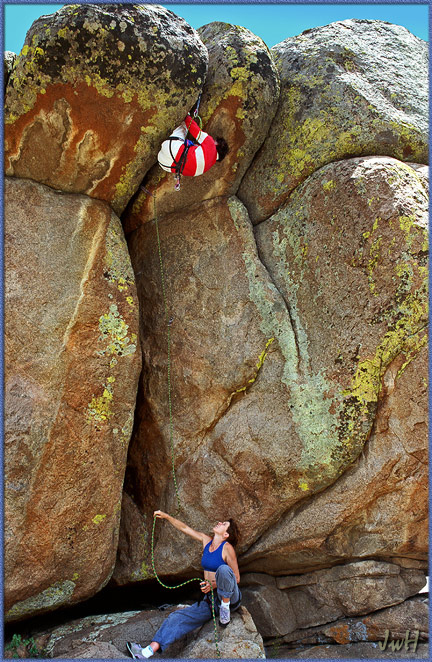 One can either pull the rope for a free ascent, or the climb can be top roped from this position. DESCENTS: 1.) A double rope rap will get you to the bottom of the route from Sphinx Ledge. 2.) 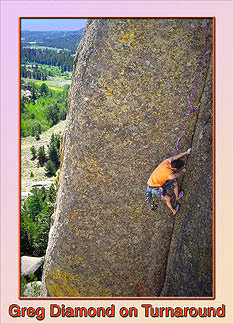 A single will get you to the bottom belay station at the start of ‘Neverending Story. From here you can make another rap to the bottom. 3.) 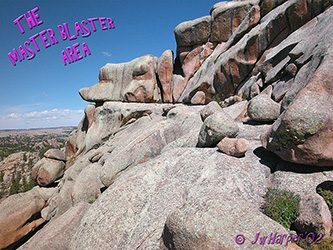 You can ascend to the top of the formation on any route and use rap stations on Fall Wall or Walt’s Wall. Another new route, “Mr. Rockbiter”, was put in at the same time as “Revenge” on the COKE BOTTLE. 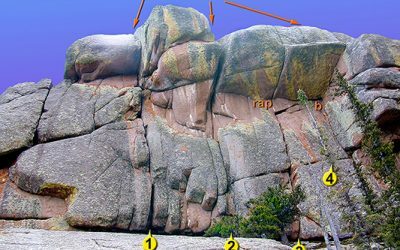 This is a 10a bolted route that ascends from Sphinx Ledge to the top of the formation (see the topo for “Revenge”) where a two Fixe Ring rap station is placed. 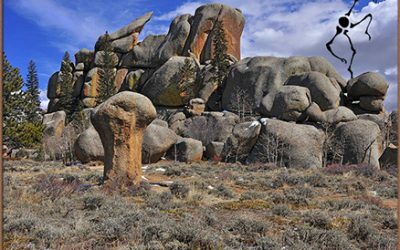 While relatively short, 6 bolts, it offers a sporty line to finish off any of the four bolted routes below, as well as Mainstreet, that ascends to Sphinx Ledge. Jamminy Crackup (11c) is a mixed (trad and bolted) climb on the northeast corner of John’s Tower in Blair that will test your skill at gymnastic movement from the start. TAPE UP! 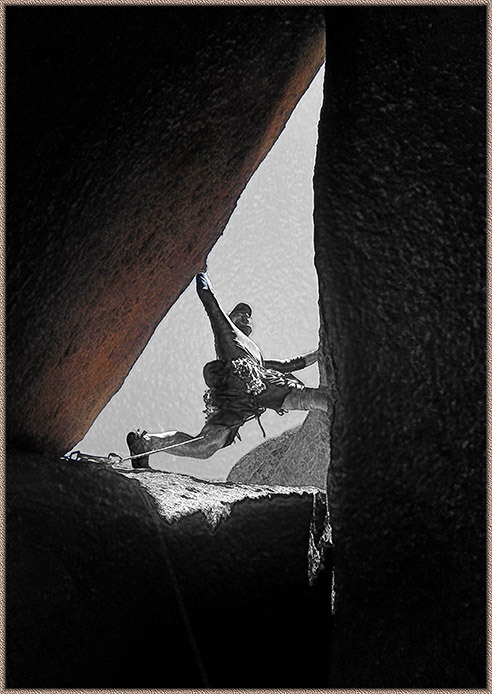 The entry moves involve nearly inverting on good hand jams to obtain a heel hook with the right foot, enabling one to gain access to the main crack system by shuffling the jams upward enough to reach a good climbing position after several feet. Place a good cam or two (2.5 Friends) or a cam and a passive piece to protect these rather daunting beginning moves. Get a 1.5 or 2 Friend ready to slam into the crack above as soon as possible. 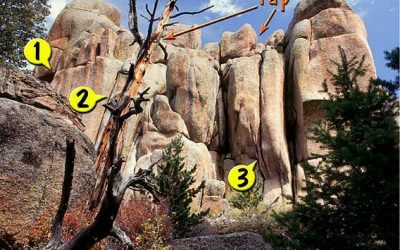 Continue past a horizontal crack and protect well here because the crux section above needs to be negotiated fairly rapidly as it is very strenuous off-fingers. Proceed to jam the slightly flaring off-fingers crack section which is slightly overhanging and leans to the right. You might be able to get in a 0.5 Camalot here, but the first good pro comes at the next horizontal crack about 12 feet above. Nearing the end of the crack system about 40′ up, better edges and flakes are found and medium sized pro goes in well. A fixed stopper is found at the end of the crack near the shelf. 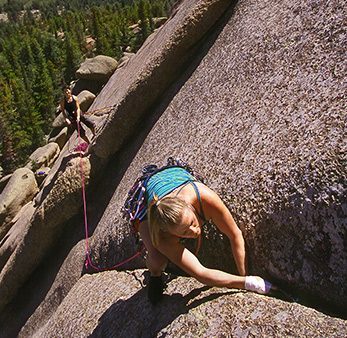 It has been left for two reasons; first, several falls have set it well, and second, it keeps the rope from being eaten by the crack as the headwall is climbed. The HEADWALL offers three different lines to the top, two are bolted and one protects scantily with a tcu and/or 2 or 3 small wires. Pick your grade to finish, 11a (leftmost, 2 bolts), 10b (center, 2 bolts) or 9 (rightmost). All three lines lead to the same Fixe Ring anchor set at the top of the headwall. Rappel 85 feet to the ground. Use caution if using a 50-meter rope as it barely stretches to reach the bottom. Get to Jamminy Crackup, park near the 8 Ball in Blair. 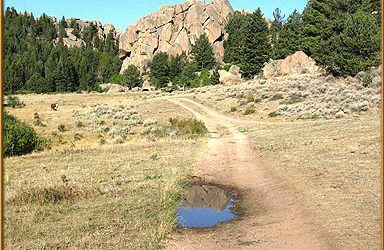 Take the trail heading SW out of the campsites amongst the large boulders and continue about 300 yards into a small valley separating the 8 Ball from John’s Tower. When an old barbed wire fence is reached, turn uphill (approx.SE) before crossing it and continue uphill on a winding faint trail. After about 200 yards, the trail begins to steepen and you will find a trail cutting up and right. Take this to the saddle between John’s Tower and the Heap to a high point where you should be looking south (across a valley) at the smooth north face of West and Middle Corner. At this point, look directly to your right (west) and you will see Jamminy Crackup. 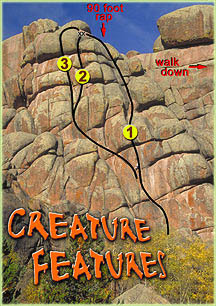 Found on the south side of the Blair 1 Formation, Creature Features is three, yes three, routes in one. It was put up in ’95 and named in part for a close-by Scarpelli classic “Little Creatures”. There is a 90-foot rap from the top where there is a Fixe Ring anchor set. 1.) 5.9, takes some wide pro. 2.) 10b, two alternatives, one is thin. 3.) 11a/b, a tough pull over a bulging hand crack – tape up for sure. 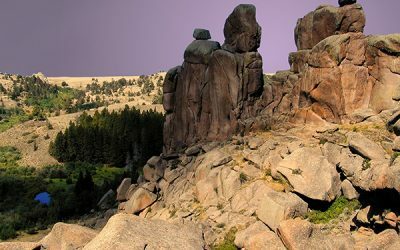 Here’s a ‘mixed’ line that promises unique adventure and challenge for anyone climbing at the grade. Turnaround, actually put up in ’93, is all trad. 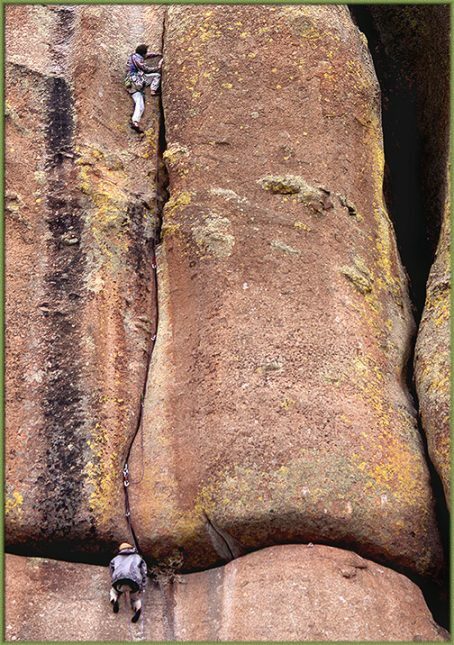 It begins with a marginally protectable offwidth trough at 5.8+ for about 40 feet to a ledge. 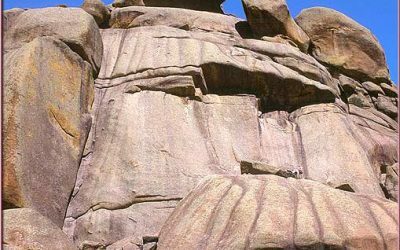 Once the ledge is attained, a large chockstone is surmounted and one “turns around” (ie faces in the opposite direction, towards the south) to find two cracks leading to the top. One on the (now right) wall is 5.8 and can be linked with the lower off width as one long line at 5.8. We are calling this Turnaround 1. To the (now) left of this is one of the finest 5.10c/d finger cracks at Vedauwoo seen in the shot at left. The super lock-offs are reminiscent of those found in Mandella on Holdout. We are calling it Turnaround 2. Descent is via a Fixe Ring Anchor set placed on the face roughly 50 feet directly north from the top of the climb. The rap takes you straight down the wide face that you saw from the bottom of the climb. To get to the rap station is rather circuitous, but well worth it and the rap takes you to the exact base of the climb. *NOTE: 90 foot rap!! One can also downclimb the Northeast end of the formation, but its quite dicey. Turnaround is located on the southeast face of Blair 2 in Lower Blair. 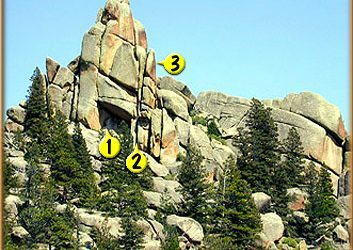 Perhaps the easiest way to locate the climb is to first find “Deadman’s Glove” and proceed about 20 feet to the right around the corner. 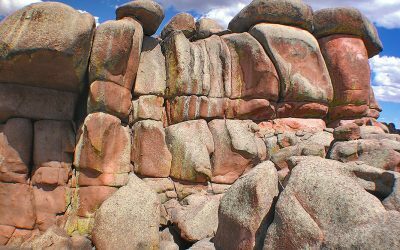 You will see the steep offwidth trough at this point, but not the cracks which are hidden from view above. 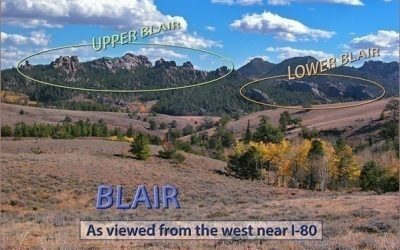 If you get to the very large boulder leaning against the face of Blair 2 under which there is a cave, you have gone too far. Check Out These New ONES!! OH SO ?? ….. Chinatown!! go to … SOUTH CORNER !! 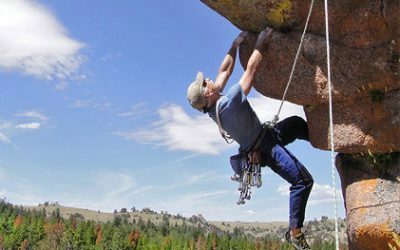 Check out the LIST OF RECOMMENDED CLIMBS below, some of the highest quality routes in each grade and in each climbing form (face, fingers, hands, offwidth). Try one of these, or strike out on your own. HAVE A BLAST.